Hitch cargo carriers are known for their practicality. They increase the carrying capacity of the trunk and they can provide an alternative to roof-mounted carriers. Most hitch cargo carriers are mounted on 1.25in and 2in receivers. If a car does not have a hitch receiver, a hitch cargo carrier cannot be mounted on it. 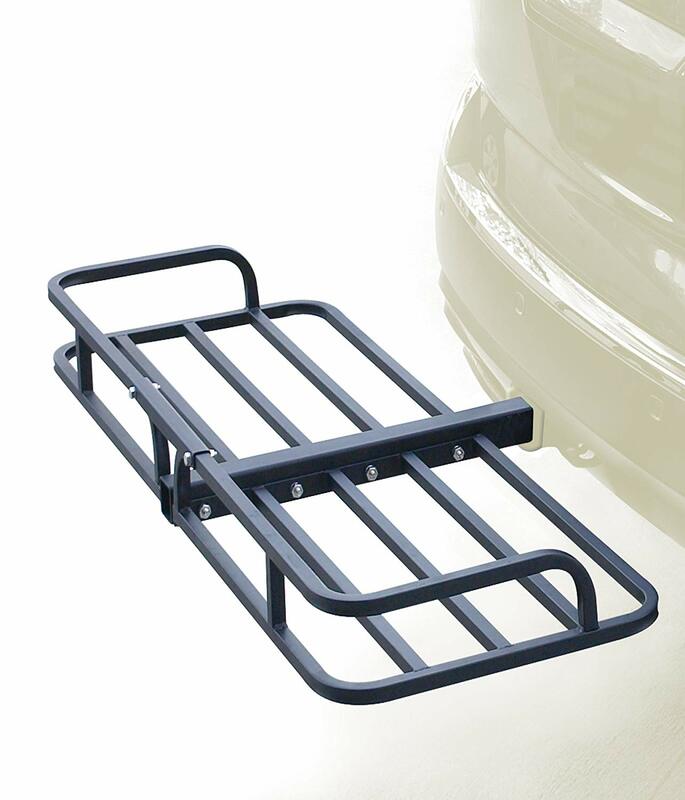 Purchasing a hitch cargo carrier now is the best time to make an informed decision. There are many great carriers to choose from and having a look at what shoppers should consider can be a good way to start towards the best purchase. Each hitch cargo has its own maximum weight limit. This maximum weight limit can be found in the product’s description as it is tested by the manufacturer. Even with different types of cargo, drivers should always know what the maximum load is. Some hitch cargo carriers come with a fixed design. They are mounted and removed from the hitch receiver simply. Others come with a flip-up design which allows the carriers to remain on the car even when not in use. The type of cargo to be transported has its influence on the selection process as well. There are now regular basket-style carriers to consider alongside carriers with a ramp. They have their own strengths and weaknesses to consider. Why we like it: Made with a folding angled shank, the carrier is among the leading designs for daily use practicality. There are a few design characteristics which make the Basket-Style Cargo Carrier a top solution for many drivers. With an angled shank, it actually raises the cargo more. This allows the cargo to remain cleaner as it collects less dirt from the road. At the same time, the closer the carrier is to the ground, the more limitations the car has on where it can travel off-road. The folding design of the carrier also allows the driver to keep it on the hitch more, without having to remove it too often. Since a mounted cargo can actually stop drivers from parking their car in the garage, freeing up space from the car’s total length can make the difference when it comes to parking the car in the garage. At the same time, it also saves drivers the effort of always having to remove the carrier when not in use. Made from tubular steel, the carrier is robust. 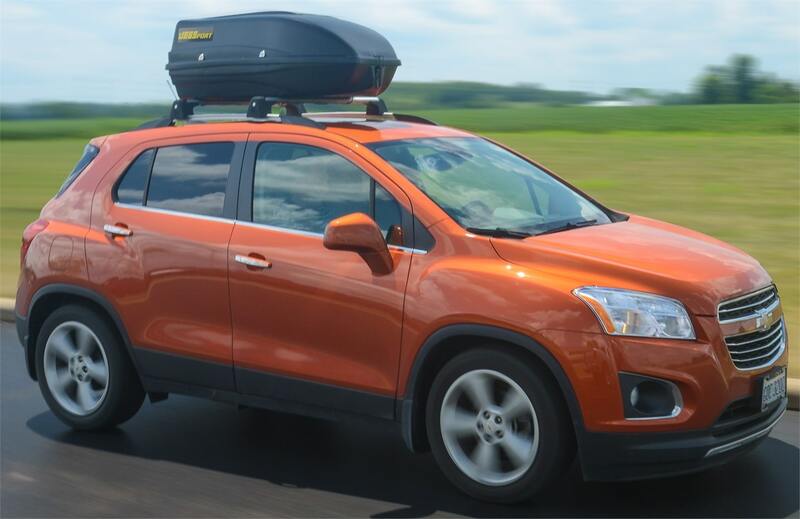 It has a 500-pound maximum load capacity and it represents a convenient choice for cars and SUVs. With 6” tall sides, it also keeps the cargo in place. The name of the carrier is derived from its basket-like bottom which is practical and supportive. It allows for dirt and rainwater to go through but it still keeps the load secured. The mesh design of the carrier also means there is not too much cleaning needed. When it comes to installation, the carrier can be mounted on the hitch easily. It comes with an instructions manual for this reason. However, some drivers have noted that extra help might be needed to fully assemble the carrier. This can be the case with the two-part binding of the carrier where the male fittings have to fit into the female side. When it comes to durability, the cargo carrier is as good as drivers can hope for. With an e-coat and powder-coat finish, it is easy to see how it would last even in changing weather conditions. Furthermore, its durability is not affected by most types of cargo, from bikes to heavy camping gear. With a strong frame and proper design practicality based on the angled shank, the carrier can be a solution for cars, SUVs or pickup trucks. Why we like it: The platform is a popular choice with 2” hitch receivers which are typically seen on SUVs. With a size of 60” X 24”, the platform is among the modern choices for cargo. It can even work for bike transportation, especially in the conditions in which it can hold two bikes. One of the main advantages when it comes to transporting bikes comes with the raised platform based on the angled shank design. It also means that bikes can be cleaner as they are higher off the ground. Of course, other types of cargo can be transported as well. It can even work with a cargo tray bag. The rugged mesh floor can actually take most types of cargo. Of course, camping equipment might need to be stored in a tray bag, especially to protect it from rain and debris. The carrier is at the same level as some of the most expensive alternatives on offer when it comes to carrying capacity. Up to 500lbs can be transported with the cargo carrier. At the same time, there is enough room to consider even a large cargo. Since it is mostly mounted on SUVs, it allows drivers to see through the back window of the vehicle in many situations. In terms of the side rails, they are nearly as high as the ones of alternative cargo carriers. At 5.5”, they can hold multiple types of cargo in place. Of course, the load should not actually damage the powder coat finish to prevent rust formation. Drivers are generally satisfied with the carrier. However, two small issues seem to come up time and time again. One is the wobble which can differ from hitch to hitch. This can be solved with an anti-rattle stabilizer. The second issue comes with the weight of the carrier. At 69 pounds, it is not the lightest in its class. So drivers might need to consider that it is not the easiest to take out of storage and mount on the car multiple times per week. With a strong metal frame and an angled shank, the carrier is mainly recommended for heavy loads. 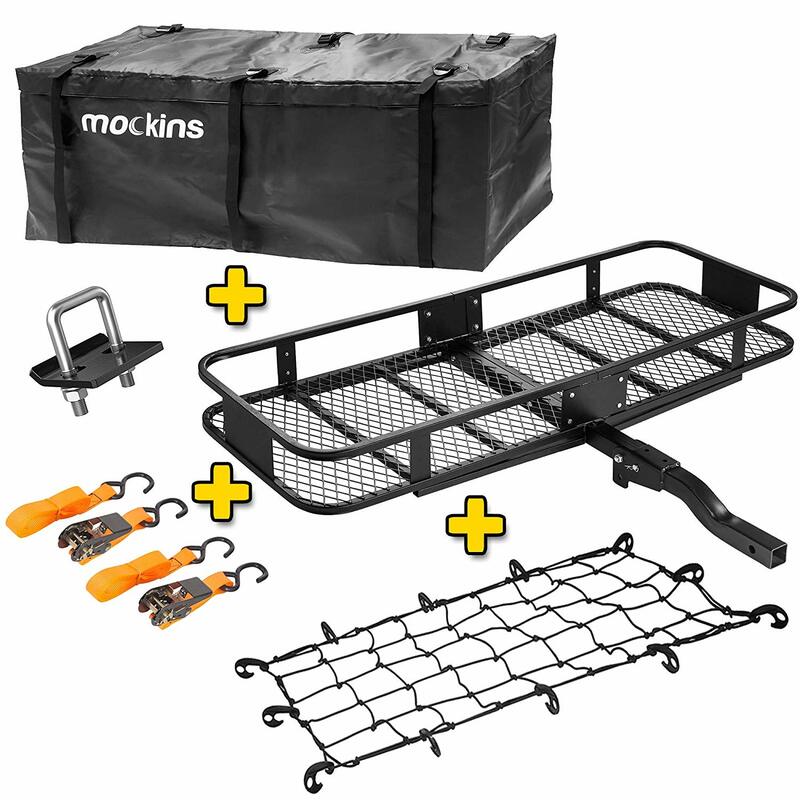 Why we like it: It offers a great starter set for all those new to hitch-mounted cargo. The set is based on a robust hitch carrier. Built to hold weights of up to 500lbs, it is one of the easiest solutions to work with for heavy loads. Each cargo bag can be safely secured to the carrier simply by using the net it comes with. The cargo bag can also be used to keep water and dirt away from camping equipment or any other cargo. It is also important to note the carrier comes with practical design characteristics. For example, it folds up to save space. Backing-up doesn’t need to be too complicated if cargo is not loaded on the carrier as it folds up to save space. At the same time, the Mockins also raised the platform, similar to what other leading manufacturers do to keep all the cargo clean. Mounted on 2” receivers, the carrier stands out when considering its simplicity. Even if it comes with instructions, it is still not overly complicated to install. Of course, it will not work on smaller hitch receivers, at least with no adapters. But following the principles of some of the most durable carriers on the market, it actually manages to offer a reliable solution for carrying cargo which doesn’t obstruct the rear window view. Given it comes with a waterproof carry bag, it might also save drivers money in the long term. Mockins is also on par with the best brands for product durability. This is seen with the impressive lifetime warranty the carrier comes with. With a simple construction and lifetime warranty, the set is recommended as a starter pack along the budget-friendly carriers. Why we like it: Based on a simple tubular metal design, the carrier is a choice for those seeking extra carrying capacity. Cargo carriers don’t need to be complicated, even if they are hitch mounted. In fact, some of the most durable cargo carriers are actually very simple. They need to be simple in order to last well in time. For example, during the winter, the salts from the road can actually damage the metal of a cargo carrier. Having a simple design which can easily be cleaned such as the MaxxHaul’s carrier is all that’s truly needed. Even with a minimalistic design, it still carries loads of up to 500lbs. So it can be a convenient way to keep the vehicle clean as it can take all types of cargo. It can also expand the luggage capacity of the vehicle. With all essential such as included reflectors, the cargo carrier is ready to be installed in minutes. There are 7 parts which need to be put together during the installation process. At the same time, the carrier is simply installed by a single person. It stands out with its simple tubular steel construction. Of course, it is not suited for smaller objects which can fall through but it can work well with larger cargo or with cargo boxes. In terms of convenience, it works on most 2” receivers. Many SUVs come with this type of receiver straight out of the factory. In some cases, drivers have reported that the hole of the securing pins does not line up. In this case, they need to be drilled in by the user. Others have stated the cargo carrier is not made with a flip-up design. 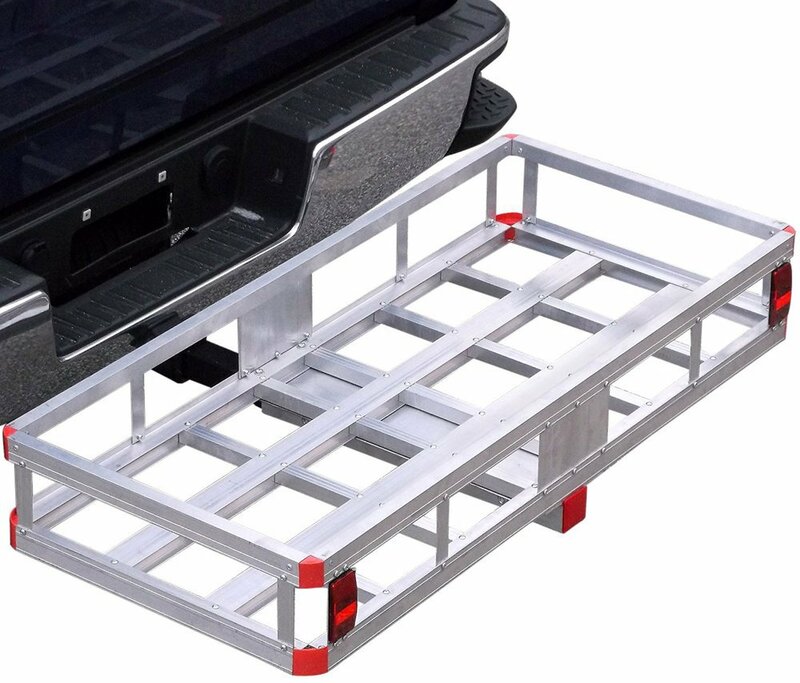 But the positive of this fixed design is seen in the price since the hitch cargo carrier is among the most affordable designs on the market. With a simple design, the carrier is recommended for heavy loads and high affordability. Why we like it: There are not too many cargo carriers with a ramp and this is worth considering for gardening equipment. Made with an access ramp, the cargo carrier is already unique. Of course, it might not be the prettiest carrier. But it offers a versatility which cannot be matched by other carriers. For example, loading a lawn mower is easy than expected based on ramp access. Other equipment can also be loaded easily. This includes small generators or even air compressors with built-in transportation wheels. Of course, there is an actual limit of what can actually be loaded on the carrier. This limit is mainly given by the actual weight of the cargo which might be difficult to push up the ramp. However, the carrier does a great job for all other cargo weights as it comes with a maximum capacity of 500lbs. An interesting design characteristic allows the ramp to fold when not in use. It remains on the carrier and it is actually part of the design. Even so, it usually doesn’t obstruct the view out of the rear window. Another design problem for asymmetrical cargo carriers comes with the rattle. It is why Apex also includes an anti-rattle system in the pack. Made from aluminum, the cargo carrier is among the lightest in its class. It comes with a weight of just 52 pounds. Of course, there is no help needed when mounting it on the hitch as a result. 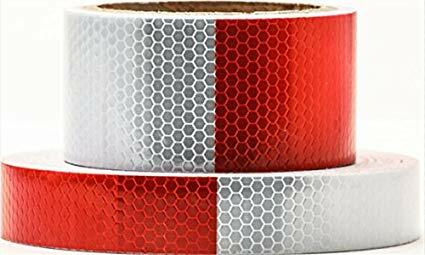 Even more, it is also worth noting the material is durable as well. With included reflectors, it can also be easily mounted on the vehicle as soon as assembled. But such a distinct design has its limitations as well. For example, its ramp doesn’t allow a flip-up design. So the carrier will remain fixed while on the hitch. Drivers need to be extra careful as a result, even when not carrying extra cargo. 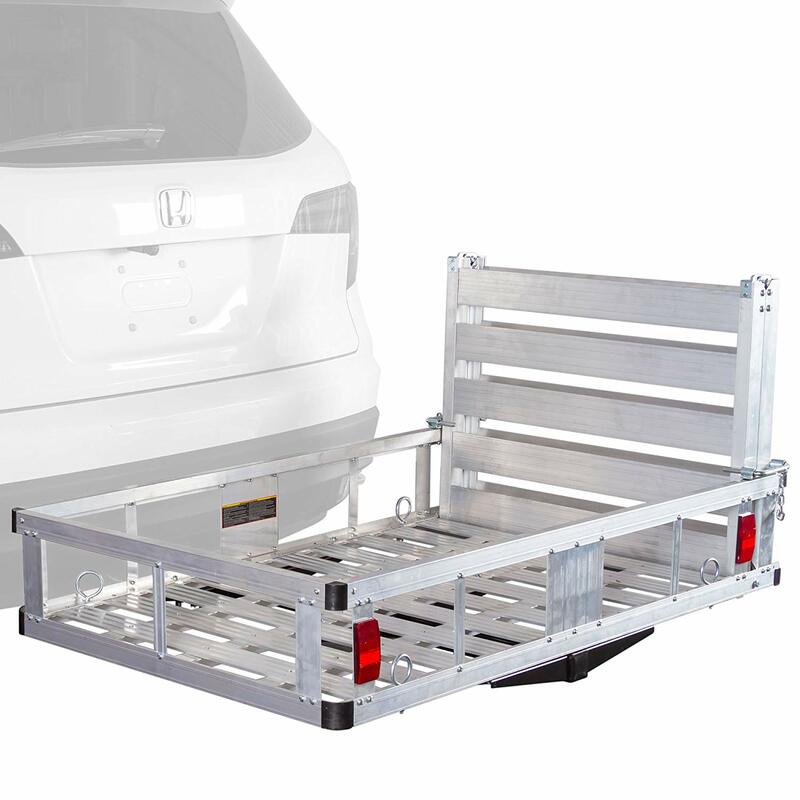 Perfect for electrical equipment, the cargo carrier can be the solution for those who don’t want to lift heavy loads. Why we like it: Those tire of cleaning up dirt off their cargo can consider Rola’s design for their signature skid and side plates. Made to handle weights of up to 450lbs, the carrier is nearly as capable as some of the heavyweights on the market. It comes with a premium feel which can be seen across the design. Drivers love the fact that it actually comes with a flip-up design. No more cars left out on the driveway and no more extra miles driven to find a place where the car can turn around due to lack of space. At the same time, it can also come with reliable lights to use for extra traffic safety. But the carrier takes safety to the next level. It also comes with a special place for the license plate to be moved from the rear of the car. It goes without saying that the cargo carrier is a must-have for those who want the cleanest cargo. In some cases, this is crucial. For this reason, the manufacturer uses panels to protect the cargo from dirt. Unlike many people believe, these are not made from metal but plastic. As a result, they do not add weight to the 72 pounds of the cargo carrier. However, the most convenient feature remains the actual folding design. Even with the skids mounted, it can still be folded up. In some cases, this also means drivers can tackle off-road situations where the carrier would hit the ground. In other cases, it can actually save space and reduce the length of the vehicle by up to 23 inches. One of the complaints which do come from drivers is with the lighting system. There’s nothing wrong with it, but it is sold separately. From bikes to camping equipment or from luggage to sporting gear, it can handle most types of cargo. With distinct premium design, the carrier is recommended for its extra practicality. Why we like it: With a width of just 19.5”, the cargo carrier is a top choice for a compact alternative to most other carriers out now. With such a compact design, the carrier is perfect for those who do not need to carry large cargo. Sold in two sizes with varying lengths of 48” and 60” as well as a width of 19.5”, it can actually save many drivers from spacing trouble. For smaller garages, it can also make the difference. In some cases, the garage door remains open with standard 23” width carrier. Mounted on 2” receivers, the carrier is capable to handle heavy weights, even if smaller in size. It is made to withstand weights of up to 500lbs. It also comes with side walls, even if not as high as those on another carrier. These walls only measure 4in in height. Made with a durable carbide powder coat finish, the carrier is recommended for its durability as well. Its tubular construction is also perfect for easy cleaning. But since it is so small, it also comes with other advantages. For example, it comes at a weight of just 23 pounds. It allows it to be easily mounted and unmounted from the hitch receiver. Those who need to go through this process often will certainly benefit from such a lightweight design. Of course, it has its limitations as well. One of the limitations to consider is that it doesn’t actually come with all-around sides. It is why the cargo needs to be properly anchored to the carrier. With one of the most compact designs on the market, the carrier is among the most practical solutions for those looking a smaller carrier. Why we like it: Made from premium aluminum, the carrier is made for those who value lightweight designs. With aluminum construction, the lightweight carrier is recommended for a simple hitch mount. Even with aluminum construction, it still manages to offer a stable platform. It can be used to carry wood or camping equipment. Drivers can also use it in combination with most cargo carrier bags. At a length of 49” and a width of 22.2”, it can work with most cargo bags on the market. This allows it to be considered for larger cargo such as wood and for more sensitive cargo, such as luggage or camping equipment. With the help of the side rails, it keeps the load anchored. Of course, it can also be used together with a cargo net for extra safety. 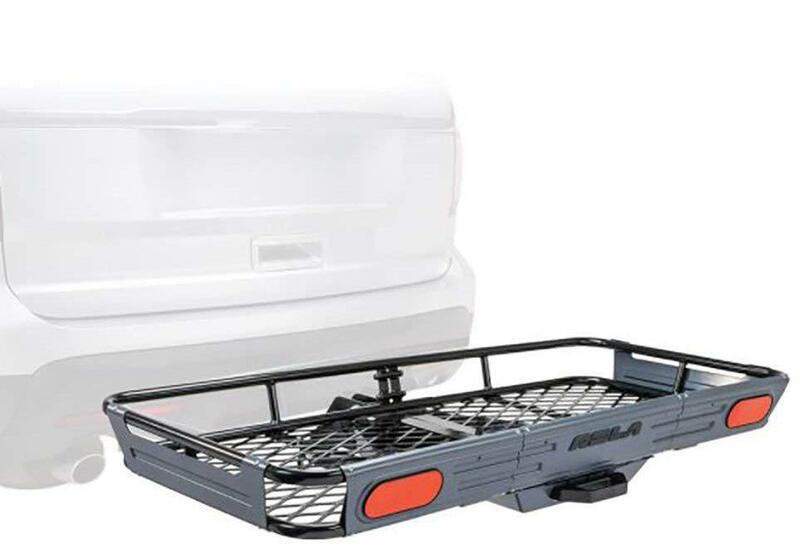 Made to withstand weights of up to 500lbs, the carrier does a great job for most drivers looking for a lightweight alternative without sacrificing load capacity. Its aluminum materials also result in easier handling. If it is not stored in a garage but in the basement, it can be handled easier. 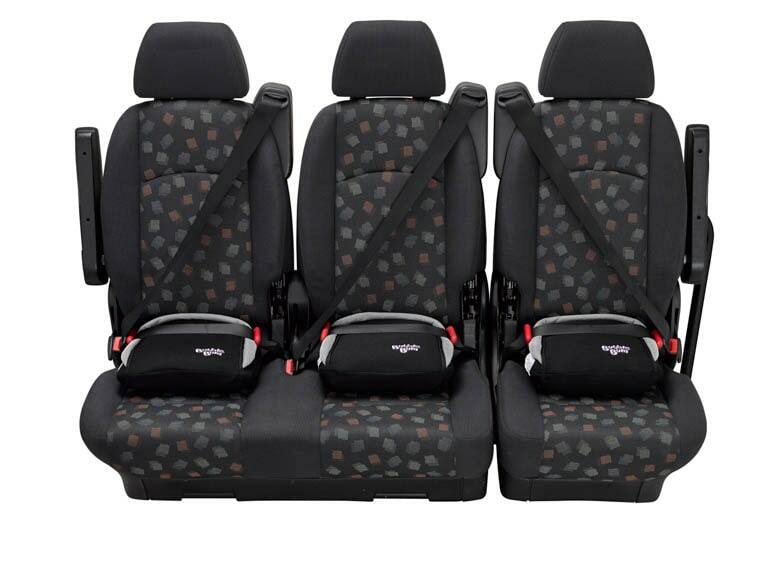 At the same time, the carrier also offers the peace of mind needed when it comes to durability. It might not come with a warranty as generous as some of the premium designs in its class, but it is still covered for possible manufacturer’s faults. With a lightweight profile, the carrier is made to be easy to mount on the hitch, without compromising load capacity. Why we like it: As one of the largest designs in the hitch-mounted cargo carriers category, it is mainly a solution for large loads. The carrier is made to handle considerable loads. As a result, it comes with a length of 57.9”. With a width of 18”, it is among the larger carriers on the market. Even so, it is often considered as the most affordable large carrier in its class. Those seeking to use a standard cargo carry bag can consider it due to these proportions. Apart from its size, it also comes with good practicality. It is why it can actually be easily folded up when not in use. The 5” height will not impede it going vertical. For such a large carrier, it still offers a manageable weight for single use. At 35lbs, it is one of the lightest designs in its class. It offers real practicality for those tired of hauling a heavy carrier up and down stairs, to and from the garage or simply lifting heavier carriers from the ground. Drivers are mostly satisfied with a lightweight alternative. But even in these conditions, it still comes with a weight capacity of 500lbs. With a welded basket floor, it is as good with wood as it is with a cargo bag. With a lightweight and a folding design, this balanced carrier can be easily mounted on most SUVs. Why we like it: With the simplest design on the list, it is an unpretentious solution to use for years. This simple design is recommended for durability. It is made by combining two large pieces together. Of course, there is no folding capacity. There is no angled shank either. But the carrier is made for the purpose and this purpose is simply carrying heavy loads without too many extras. With a considerable size based on a 60in length, the carrier works on most large vehicles. Of course, since it uses 2” receivers this means those vehicles are actually SUVs or pickups. However, since it comes with included tie-down points, it can even handle off-road driving. Based on a steel mesh floor, the carrier can work with various loads. From small to large objects, it is considered for daily use. However, drivers should not expect any kind of practicality. There is no foldable design as there is no angled shank. Those transporting commercial gear or gardening equipment might consider it an option for their carrying needs. Its industrial design and its affordable price make it a top choice for these purposes. However, drivers might also want to consider an anti-rattle mechanism for a smoother driving experience. 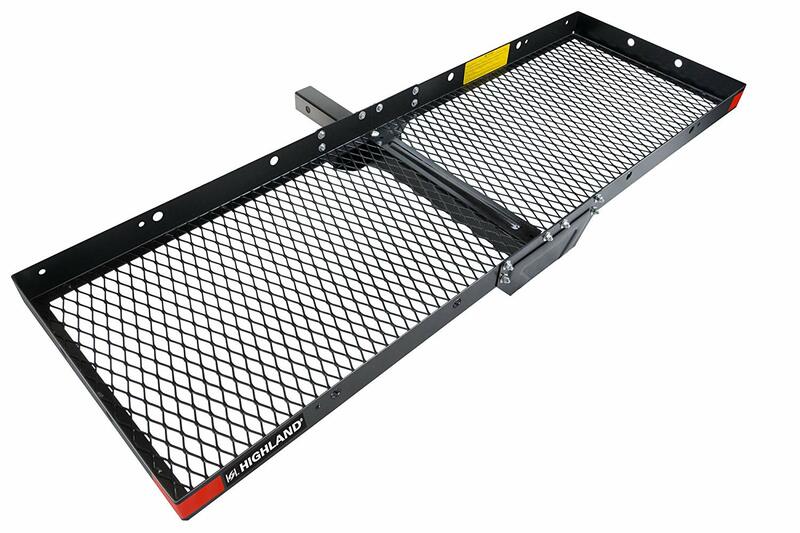 Made for heavy loads at a low price, the carrier can be hitch mounted by drivers carrying all types of heavy equipment. Can I mount a hitch cargo carrier on my car? If your car has a hitch receiver, a carrier can be used. Most SUVs and pickups have a hitch receiver. Types of hitch receivers include 1.25in and 2in designs. Is there a way to install a hitch on my car? If your car does not have an installed hitch receiver, mounting a cargo carrier is not possible. However, some cars can have a hitch receiver installed. For this purpose, it is recommended to seek the help of a garage. 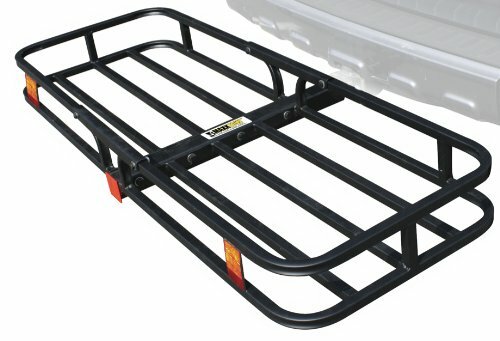 Should I get a cargo carrier or a bike rack? Those only planning to transport a bike or two bikes can consider a bike rack. However, if the cargo is always different and if drivers want to carry other things apart from bikes, a cargo carrier proves to be more versatile. As its name suggests, cargo carriers are mainly made for cargo. What is an anti-rattle stabilizer? An anti-rattle stabilizer blocks the carrier’s wobble. This wobble can come as a result of extra space between the shank and the receiver. The stabilizer actually brings the shank next to the receiver, minimizing the space between the two. It results in to reduce or no wobble. Is it legal to use a hitch cargo carrier? It is legal to use a hitch cargo carrier on most public roads. However, it should be clear that the receiver should not block the view of the license plate. It should also not obstruct the view of the tail lights of the vehicle. In case these lights are not visible, additional lights need to be installed on the carrier. Does a hitch cargo carrier freeze? Some drivers have a hard time removing the hitch receiver during the winter. Since it is practically a system of metal on metal, it can get stuck at freezing temperatures. The best way to deal with the issue is to park the car in the garage where the higher temperature will allow the carrier to be removed. How heavy is a hitch cargo carrier? The weight of the hitch cargo carrier depends on its materials and on its size. It can vary from 20 to 70 pounds. However, it doesn’t mean that a lightweight carrier doesn’t have the same maximum load capacity in most cases. Finding the best hitch cargo carrier might not be easy. Drivers generally don’t know how to handle a carrier or what to expect from it if they haven’t used one before. This is why having a look at its essential characteristics is recommended when going out to make the first purchase. The first thing to keep in mind comes with hitch compatibility. Both 1.25in and 2in receivers actually need to be compatible with the desired carrier. At the same time, there are ways around this issue. 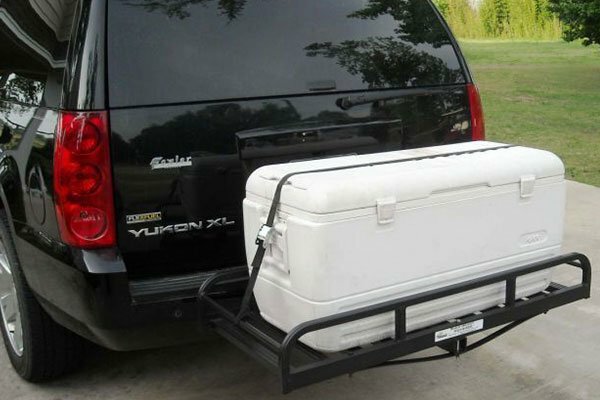 For example, hitch adapters can be used to transition between these two types of carriers. Load capacity is crucial. It has constantly gone up since the first carriers appeared on the market. It is also expected for this capacity to increase further. At the same time, it is not needed for a carrier to come with the best carrying capacity, as this depends on each user. Some of the leading carrier available today comes with a maximum load capacity of up to 500lbs. This should be enough for most users. At the same time, drivers also need to check the maximum weight which can be added to the back of the vehicle, especially if the trunk is already loaded with cargo. Load capacity can also influence fuel consumption. It is expected that the vehicle actually consumed more fuel when the carrier is fully loaded. At the same time, this should not have a major impact on the final fuel consumption every month. Since there are so many types of cargo carriers, people can get confused. But complicated problems often have easy solutions. For this reason, choosing between a fixed and folding design is actually a matter of preference. Some drivers don’t even need a folding design as they rarely use the carrier. Others prefer the folding design for the moments when cargo is not loaded. At the same time, this choice can also be made automatically by limitations such as garage length. If the vehicle doesn’t fully fit into the garage while the carrier is mounted, it either needs to be removed from the hitch or the carrier needs to come with folding design. For this issue, there is a solution in the form of more compact carriers, which can allow some extra maneuverability space for the vehicle. As most people expect, practical fold-up designs offer the most versatility. 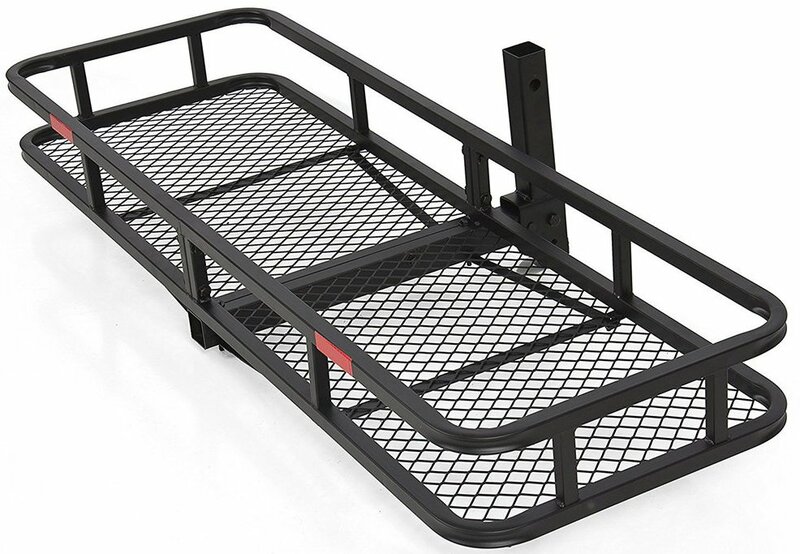 Since there now is ramp carrier on sale, people are debating their purpose for their own use. The truth is also subjective. Some may not even need a ramp. Others might need to carry equipment such as lawn mowers. In these conditions, it is essential to look for the best results, especially when it comes to ease of access. Some of this equipment is not lightweight and easy to lift onto the carrier. For this reason, ramp access can actually be quite rewarding. Steel and aluminum are mainly used in cargo carrier construction. These materials might not be the most premium choices, but they are the most durable and the best for heavy loads. Steel needs to be protected from rust. It is why most steel cargo carriers usually come with a powder coat finish. Unlike other carriers, it actually allows people to take the cargo in off-road locations as it is also very easy to clean. Aluminum is a top choice as well. It comes with a lower weight. As a result, drivers who don’t like to lift heavy objects can consider it for their own use. The durability of most cargo carrier is impressive. As long as drivers don’t force more weight than they can handle, they should last for years and years. They also come with different warranties. Some products are only covered for a year. Others are actually covered for life. One of the aspects to consider comes with the price of a hitch cargo carrier. From affordable to premium, prices vary. Every driver has a personal budget and it is recommended to abide by it. Those seeking a budget-friendly solution can even consider a pack which would include a cargo carrier, a cargo net, and an anti-rattle stabilizer. When they are purchased together, they are often more affordable than when purchased separately. More expensive cargo carriers, on the other hand, can actually come with more features. These features can include an angled shank or a folding design. If the cargo carrier fits into the hitch receiver, the mounting is already done. The good news is that mounting all of these cargo carriers are easy to mount. In most cases, they come shipped in boxes. Users have to follow the instructions manual for proper installation directions. But most products only come with 5 to 10 pieces which need to be put together. As a result, it should not take more than 30 minutes to install. Hitch-mounted cargo carriers also have different advantages. Unlike roof-mounted cargo carriers, they don’t require users to lift the cargo too high. At the same time, they rarely impeded the vehicle’s aerodynamic performance. But most importantly, hitch carriers are actually expanding the carrying capacity of a vehicle. With load capacity of up to 500lbs, drivers can go camping without making a mess in their cars. They can carry bikes without needing to cram them in the trunk. Drivers can also carry extra luggage when going on trips or even when moving homes. With prices to meet all needs, hitch mounted carriers are usually worth the investment.